"A rose is a rose is a rose . . ." (- Gertrude Stein), but our roses will last a lifetime. 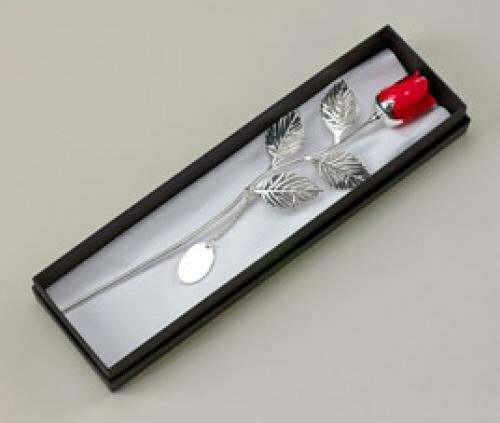 This 12.75" rose has a non-tarnishing silver-plated finish with a red epoxy rose at top and attached engraving plate for your special message (up to 25 characters engraved). 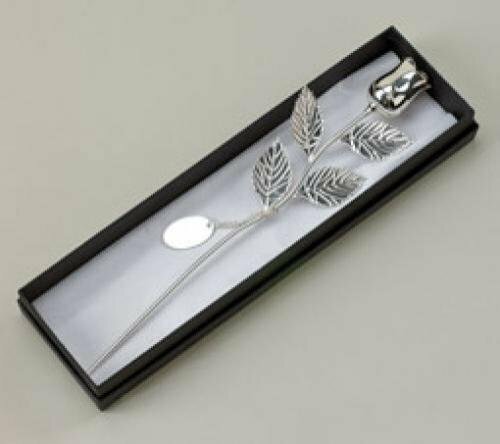 Each also comes with an attractive, lift top presentation box with the rose on a bed of tissue. So beautiful you may be able to smell their fragrance. Credit card will be charged for 50% of the total price of the order when order is placed; total remaining amount is due in accordance with store policies. Place in cart to order online, specify text, and select in-store pickup or other shipping method. Credit card will be charged for 50% of the total price of the order when order is placed; total remaining amount is due in accordance with store policies. "A rose is a rose is a rose . . ." (- Gertrude Stein), but our roses will last a lifetime. 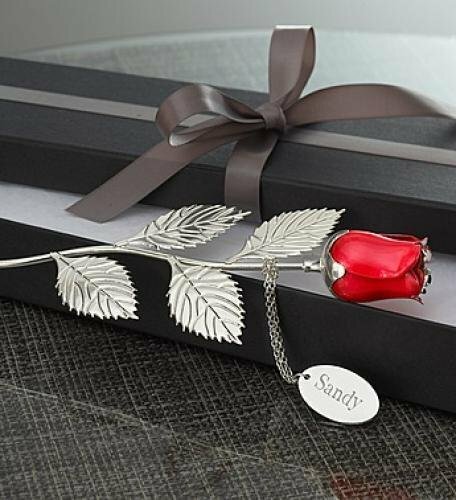 This 12.75" rose has a non-tarnishing silver-plated finish with a silver rose at top and attached engraving plate for your special message (up to 25 characters engraved). Each also comes with an attractive, lift top presentation box with the rose on a bed of tissue. So beautiful you may be able to smell their fragrance.